LONDON 2012's Equestrian events have concluded, with Team GB scoring a brace of medals in Greenwich Park. 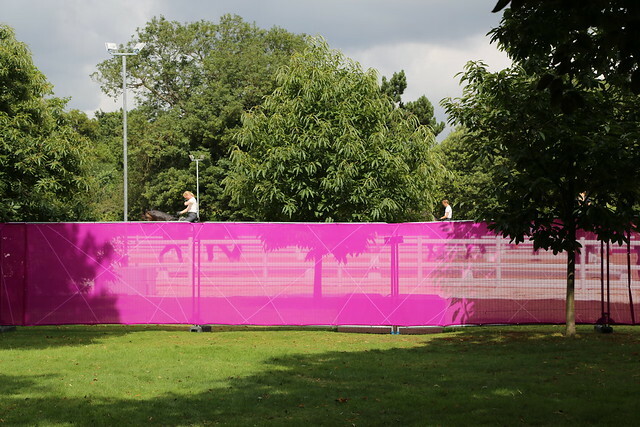 Although the Modern Pentathlon events are still to take place this weekend, parts of the park have begun to open up again and work is now under way to restore it. Locog had previously published plans for the phased re-opening of the park that indicated large swathes would be accessible from August 4th. But when the day came, despite London 2012 posters on gates saying the park was re-opening "as planned", many gates were still locked, the opening of the Observatory had been delayed by ten days and the expected crossing points between the East and West sides of the park weren't present. 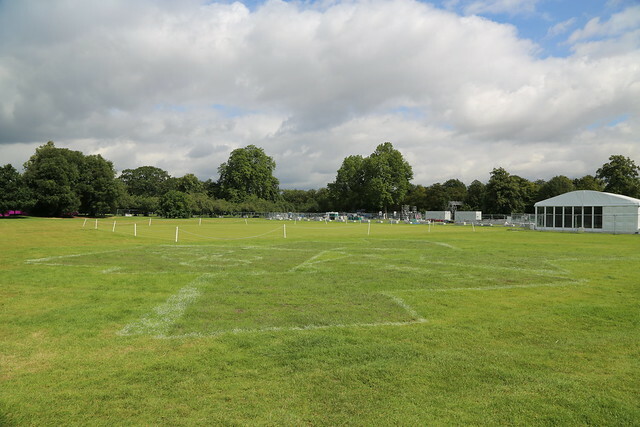 One local councillor, Matthew Pennycook, took to his blog to express his disappointment, adding that "the incremental opening of the park and the revisions being made ... lie outside the spirit of the original planning permission." By Wednesday of this week, about 30% of the park had been reopened and Royal Parks invited the local media to learn more about the reinstatement ahead. Royal Parks are already working on reinstating areas of the park on the cross country route. 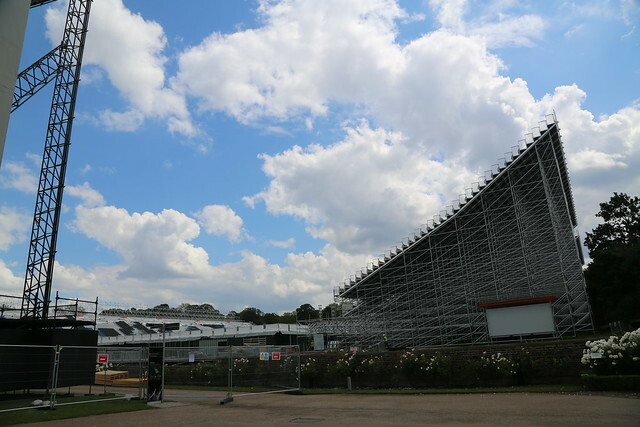 The final part of the park to be handed back to them will be in the stadium area which isn't expected to be completely taken down until November. 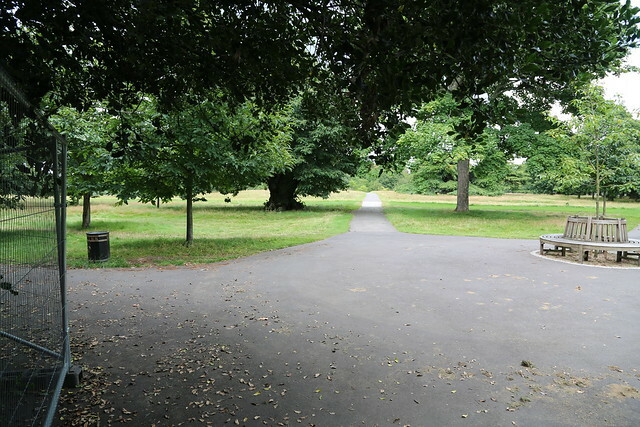 These are a selection of images from the re-opened parts of the park followed by comments from Park Manager, Graham Dear, and Royal Parks' London 2012 Project Manager, Derrick Spurr. About 30% of the park has now reopened - this picture was taken from the Crooms Hill Gate entrance. Areas of grass that have had heavy structures or trackway laid may be fenced off so that the ground can be protected as it recovers. The tennis courts will reopen in September - they have been used as a warm area for horses. The cross country course went past the Henry Moore statue. The photo shows where the course went through the now famous Acid Grass. Park bosses have previously described how they plan to use chemical solution Rescue on affected acid grasslands. 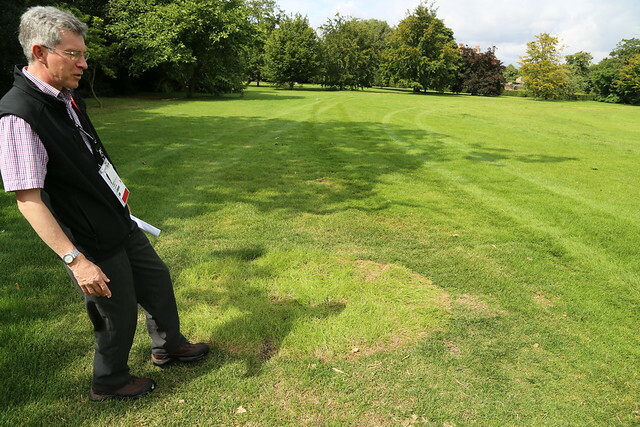 Park Manager shows where the Cricket Ball jump was on the cross country course. A London 2012 logo spray painted on for the benefit of an overhead cable cam is beginning to fad and grow out. 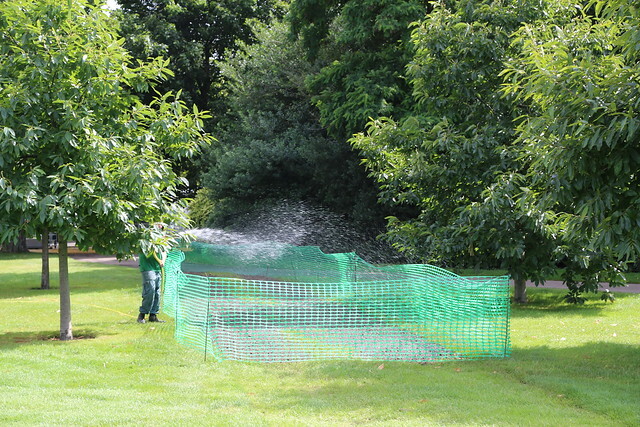 What work will be carried out on damaged grass in the park? GD: All around the cross country route we are going around with a machine that we call Vertidrain. It's a spiker that we use where the ground may be compacted. That gets air in to the soil to allow it to drain. It's only a precautionary thing really. Where the grass has gone yellow, if it's going to recover we'll just scarify it, mow it over, rake out any of the thatch, maybe put a bit of quick release fertiliser on to give it a boost and it will be fine. That is a lot of the reinstatement. In other areas where you've had overlay, for instance underneath heavy concrete blocks, the grass will be dead so we'll have to scarify it, fork it over, put a bit of top soil and seed it. If there are very large areas, we may decide to turf it. DS: Within one growing season, it will be very difficult to see where the events have taken place and I'm absolutely confident of that. Will any special work be required at the "take off" areas before each jump on the cross country course? GD: We will fork it, lift it, put a bit of top soil down and seed it, but on the course, it's actually not that bad. Why has the schedule for re-opening parts of the park slipped? GD: We'll open it as soon as possible in consultation with Locog but only when it's safe to do so. DS: We've opened up about a third of the park. We said we'd start to open up on the 4th and now it's the 8th. We're hopefully going to be opening up more later this week, I don't feel like we're too far behind. In that promise that was made, there was a caveat. Lots of big things moving around don't mix too well with the public so we're very anxious about health and safety and so is Locog. The biggest issue is that there's no East West connection which we're pushing Locog hard to get because we've opened both sides but people want to come in one side and go out the other. They've not given us a clear date but we're pushing hard. When will the new Blackheath Gate be finished? DS: The first phase has been done. The new gate and the central pillar will go in with work starting in November. Brick work can be quite weather sensitive but the plan is to start in November and carry on until January or February. I was Park Manager here for 14 years and it was always one of my ambitions to get those gates done so it will be nice to see it whilst I'm still here! 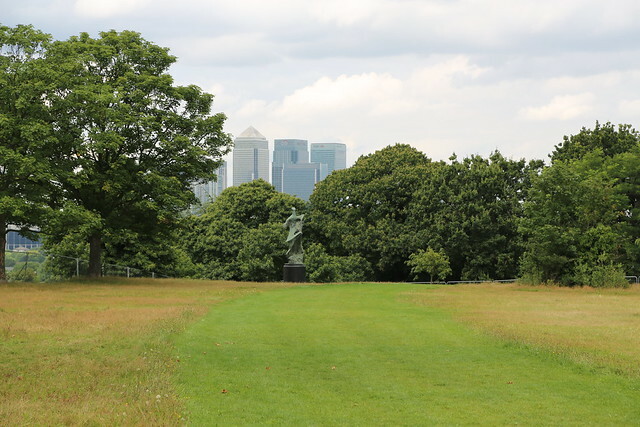 With the perceived success of the equestrian events in Greenwich Park, will it be a once-in-a-lifetime experience or might other such competitions be staged there in the future? DS: There's no plans to have events of this type in the foreseeable future. You never know what will come our way as the Royal Parks and we consider events if it's practical to put them on, but at the moment in time, the answer is there's none planned. Royal Parks have promised another briefing in September. AFTER years of argument and planning, Greenwich Park today witnessed the cross country stage of London 2012 Equestrian Eventing. On the only day of the Olympics that the entire park was closed, 50,000 spectators watched on from busy vantage points along the course and from inside the temporary arena. 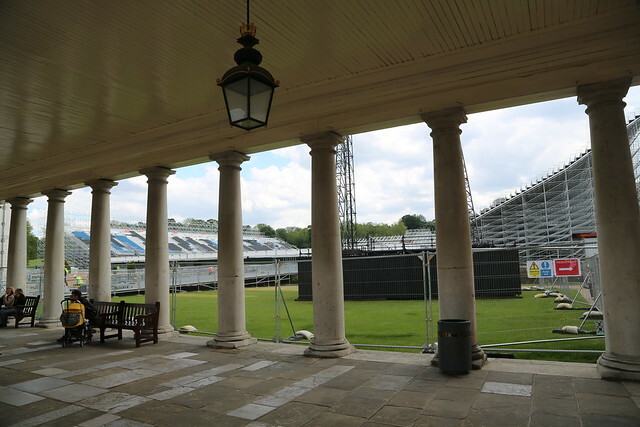 With millions watching on television, the sunny weather played its part to ensure that the venue looked stunning as cable cameras tracked high above Greenwich Park, first enclosed nearly 600 years ago. It was a good day for Team GB, with three riders - including the Queen's granddaughter, Zara Phillips - completing the ride within the course time of 10m 3s. The cross country stage follows two days of dressage in the temporary stadium where swathes of empty seats, in common with other venues, were witnessed on TV. The venue was also hit by a lack of food supplies early within the sessions on Saturday and Sunday with many spectators taking to Twitter complaining they had nothing to eat and couldn't leave the venue and return. A spokesperson for London 2012 told Greenwich.co.uk that "measures have been taken" in response to the food shortages. 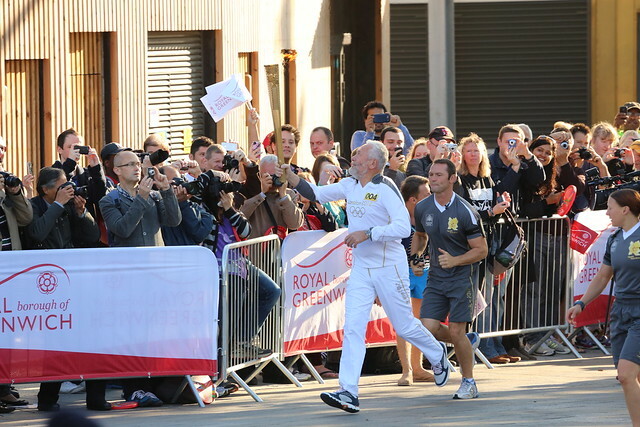 The Olympic Torch Relay completed its visit to the Royal Borough of Greenwich yesterday. Starting its journey behind the security fences of Greenwich Park, viewed by the accredited few, the flame emerged into public view in the Old Royal Naval College. By the time it reached Cutty Sark Gardens, where crowds had been gathering in anticipation, it was being clutched by famed sailor Sir Robin Knox-Johnston as he completed a single-handed circumnavigation of the restored tea clipper. A few seconds after appearing in view, the sprightly 73-year-old had disappeared again as he made his way down College Approach. 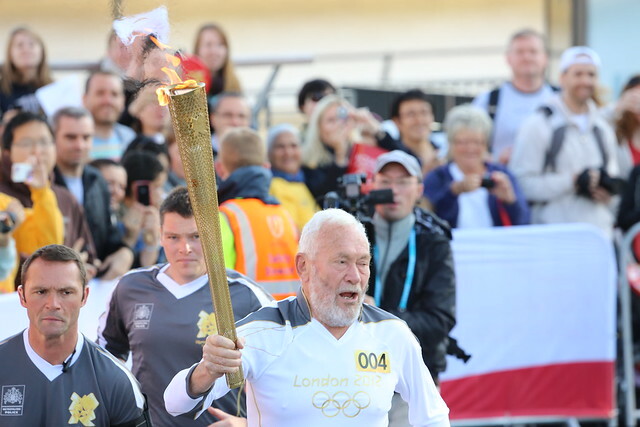 Sir Robin Knox-Johnston is a trustee of the Cutty Sark Trust. 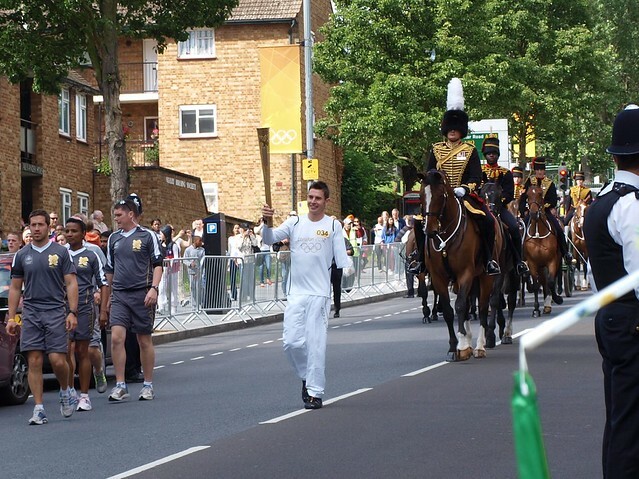 The torch then continued on its tour of the borough. 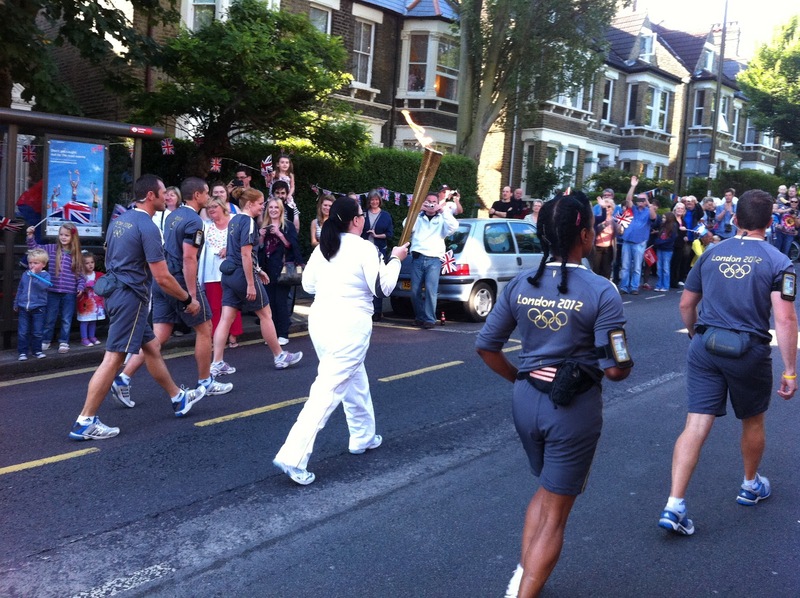 Being carried up in Westcombe Hill - photo from Charlton Casual blog. 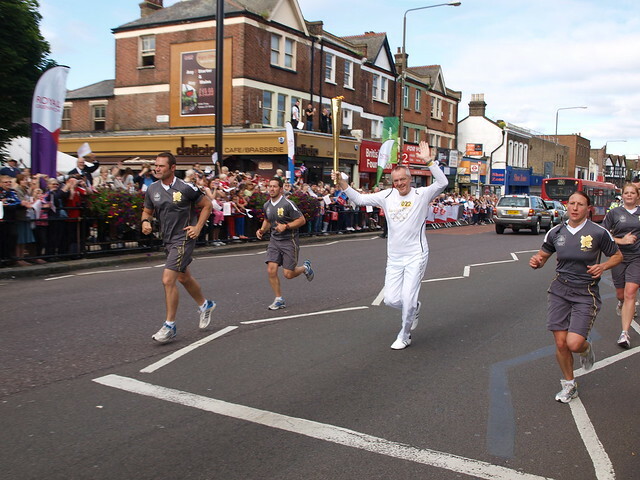 The crowds came out on Eltham High Street - Pic: Nigel Fletcher. 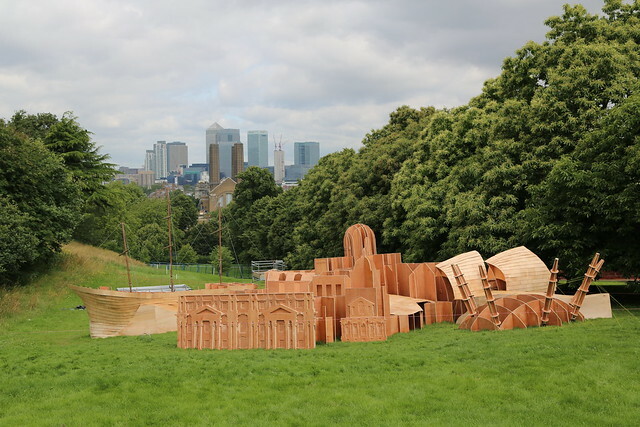 LONDON 2012 organisers have unveiled the Greenwich-themed "jump zone" on the Olympic cross country course. 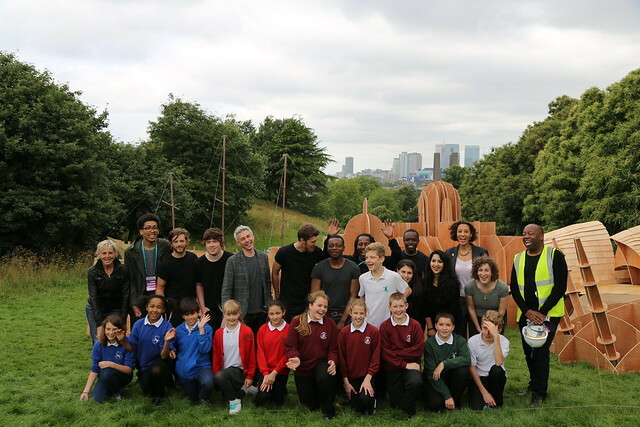 National and London landmarks will be the inspiration for the areas around the 40 jumps on the course, known as jump zones, and local school kids were last year invited to come up with designs for a Greenwich-themed jump zone. Successful designs came from students at Joan Roan School, Alderwood Primary School, Timbercroft Primary School and Invicta Primary School. The plans were then turned into a plywood backdrop by students at Ravensbourne College and shown off for the first time this morning. Double Olympic champion, Jonathan Edwards, said the sculpture was "brilliant" and offered a "super view" with Canary Wharf in the background behind it. Local school kids and students from Ravensbourne pose in front of the jump zone. Course designer Sue Benson told Greenwich.co.uk that the cross country course was "beyond my dreams." "It's been brought together beautifully," she added. "There's masses of decoration to put in but the fences are all in their correct sites and they've all been measured to legal height. I'm really comfortable with it." The cross country event will take place on July 30th. 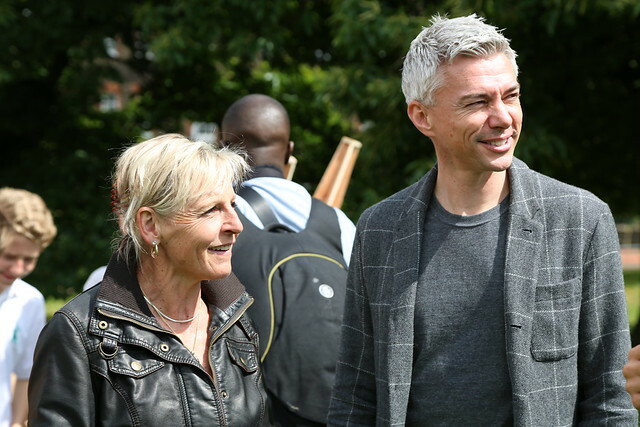 Course designer Sue Benson with Jonathan Edwardes from London 2012. London 2012 chairman Seb Coe told journalists this morning that parts of Greenwich Park had been left "waterlogged" by recent rain. 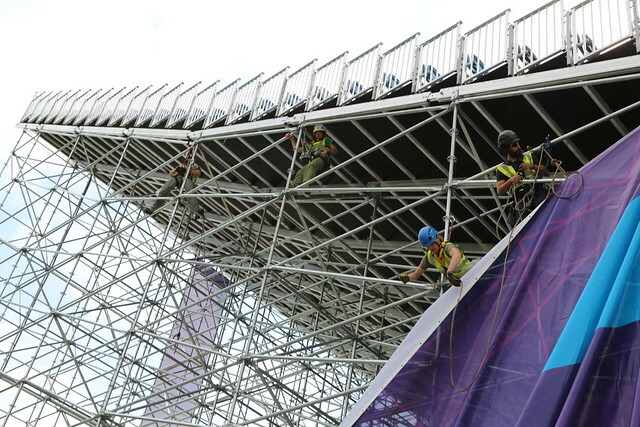 Photos of the London 2012 stadium in Greenwich Park that is being constructed for the staging of equestrian events. 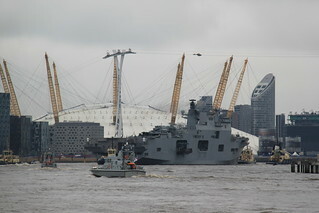 SURFACE-TO-AIR missiles have been set up on Blackheath and the Royal Navy's largest vessel has moored at Greenwich. The stark images of militarisation will be broadcast around the world as the Navy and RAF prepare for this summer's Olympic games. 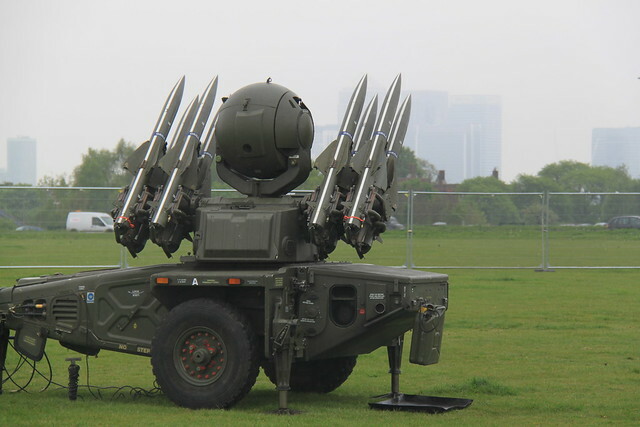 Rapier surface-to air-missiles, last used in the Falklands, have been set up on Blackheath - described by Air Vice-Marshall Stuart Atha as a "first class site". 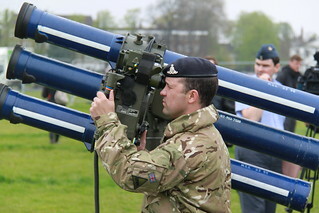 The Starstreak High Velocity Missile system will also help protect London 2012 from potential airborne threats this summer. 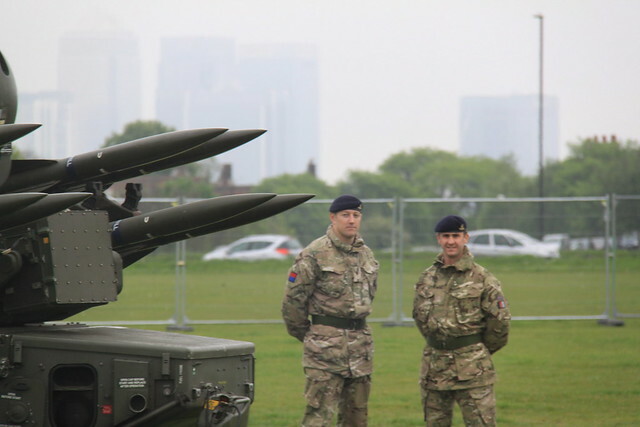 They have been placed on Blackheath this weekend as the RAF continues to finalise plans to position the missiles in six sites in east London. Oxleas Meadow has also been selected as a location for the missile defence systems. The missiles can offer protection spanning a five mile radius. Any decision to deploy the weapons, in the event of a threat in the airspace, will be taken at a "political level". Personnel operating the equipment will be based at the nearby Army Cadet Centre during London 2012. 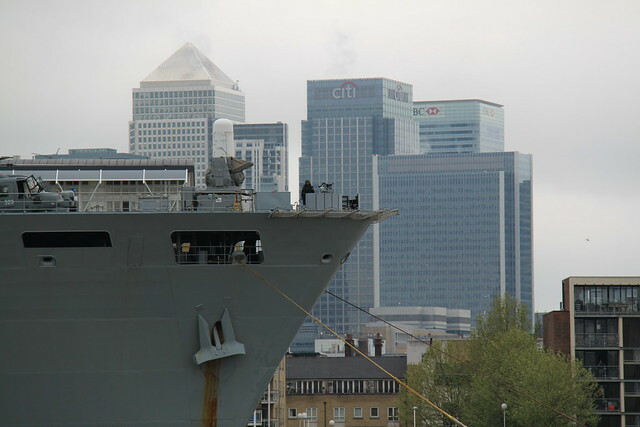 The Royal Navy is also preparing for its role in protecting the capital and today brought the largest ship in its fleet, HMS Ocean, to Greenwich for a week of exercises. 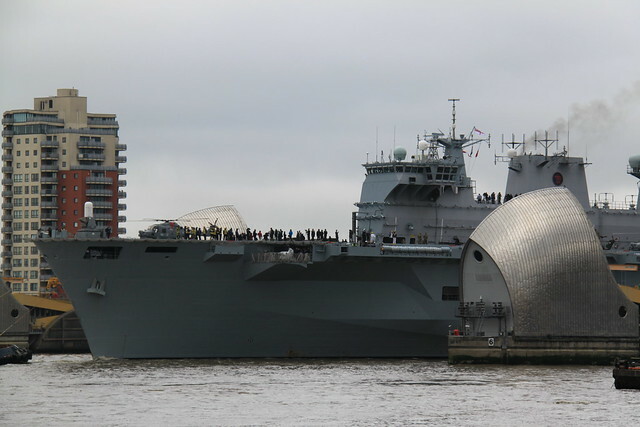 The 200 metre long amphibious assault ship, nicknamed as the Mighty O, sailed up the Thames this morning, passing through the Thames Barrier just before eleven. After passing the O2 she was turned around and then pulled towards her mooring at Greenwich Reach. Lynx helipcopters will be taking part in exercises from HMS Ocean over the weekend and next week exercises will take place on the river. Greenwich borough residents will have the chance to go on board HMS Ocean on Monday - details available from the council website. 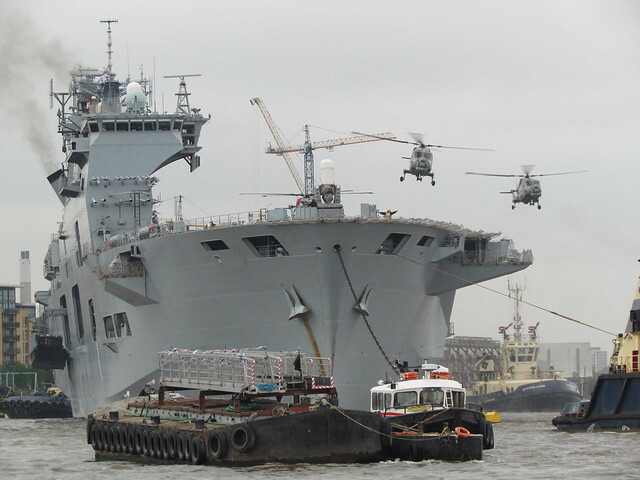 "HMS Ocean's arrival in London on the River Thames today completes the build-up of military assets and personnel taking part in Exercise Olympic Guardian over the coming days which will test the role of the Armed Forces in keeping the Games safe and secure. "The public will expect that we are ready and prepared in the unlikely event that any threat emerges. That is why Typhoon fast jets are stationed at RAF Northolt, ground-based air defences are being tested at sites across London, and helicopters and Royal Marines will be operating from HMS Ocean, the Royal Navy's largest ship, berthed at Greenwich. A GIANT shot put could be placed in the Old Royal Naval College this summer to mark the London 2012 Olympics. The 3m sculpture would sit upon an "impact crater debris" plinth in front of the entrance to Discover Greenwich. Planning permission for the public art has been applied for by Di Henry, the GLA Events and Cultural Campaigns Manager. The huge shot put, also just known as the shot, would be there from July 1st until September 30th and would be "in honour of the Olympics," says the planning application. The shot put would be part of a series of large sporting monuments titled "Gift of the Gods". Other items to be placed across the capital include a 7m long javelin, a set of 3m long Union flag arrows and a 3m discus. Update: 7th June 2012 - The sculpture's planning application was approved by the council. 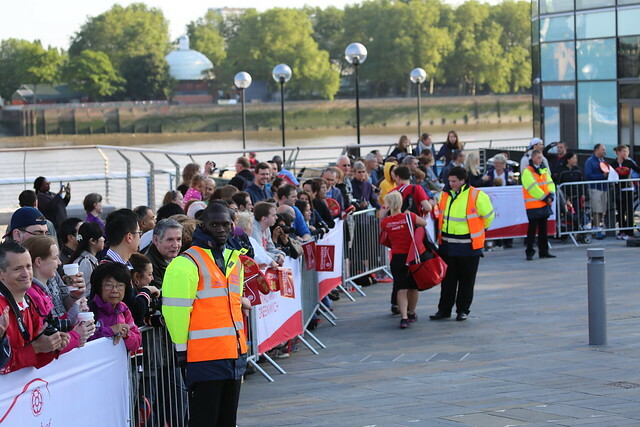 FULL details of where you can see the Olympic Torch Relay when it arrives in Greenwich have been revealed. 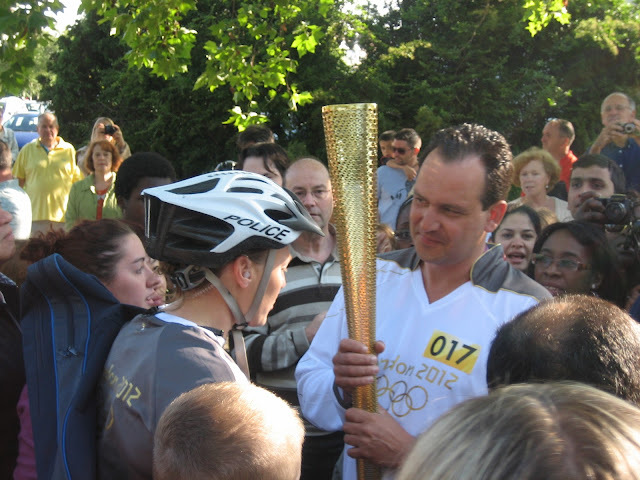 The flame will start the SE10 leg of its journey in Greenwich Park on Saturday 21st July at 07:21. 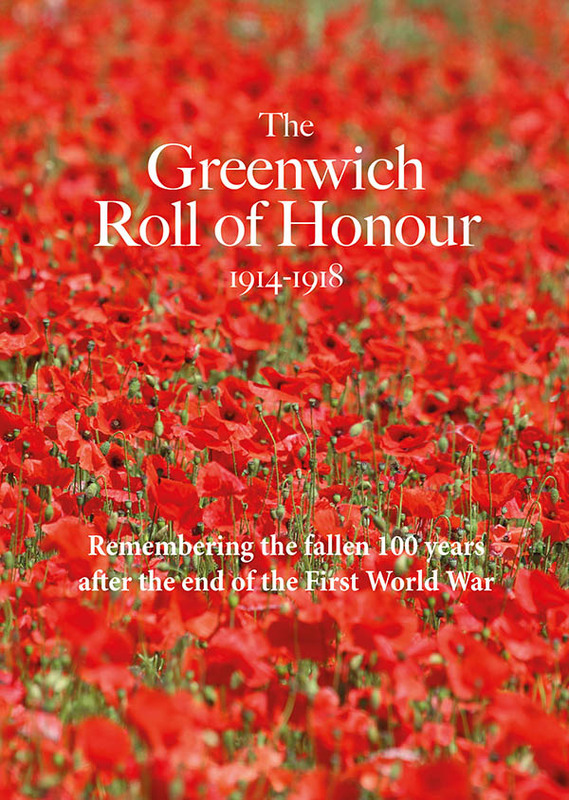 It will be carried down to, and through, the newly built equestrian venue in the Park before crossing Romney Road in to the Old Royal Naval College. It will then visit the redeveloped Cutty Sark Gardens and then return to Romney Road to head east. Torchbearers will carry it along Trafalgar Road and Woolwich Road before turning into Combedale Road and then Westcombe Hill. Its journey will then take it on to Eltham and it will finish its three hour stint in the borough in Woolwich's General Gordon Square. Councillor Chris Roberts, Leader of the Royal Borough of Greenwich, said: “This announcement really brings the route to life and it will provide a unique chance for Greenwich residents to share in the excitement of the Olympic spirit as we mark the countdown to the 2012 Games. 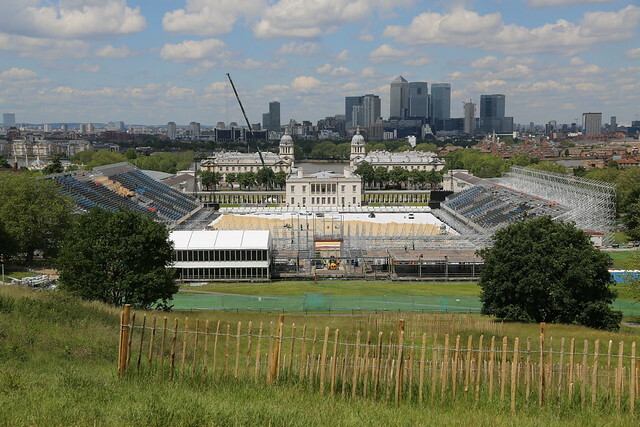 GREENWICH will be at the forefront of protecting London during next Summer's Olympics, it has been revealed. The Royal Navy's HMS Ocean will be moored at Greenwich and used for logistics support, accommodation and as a helicopter landing site. Puma and Lynx helicopters will operate from the "Mighty O" to support airspace security. The announcement that the 200-metre-long amphibious assault ship would be berthed at Greenwich was made today by Defence Secretary, Philip Hammond. "I am proud to announce the role our Armed Forces will play in support of the police, LOCOG [London Organising Committee of the Olympic and Paralympic Games], and others, in delivering a safe and secure Games. "The Royal Navy, Army and Royal Air Force between them will provide up to 13,500 personnel. Up to 7,500 of them will support the smooth running of Olympic sites, while the remainder will use their specialist capabilities and equipment to contribute to the delivery of Olympic security. HMS Bulwark, a visitor to Greenwich earlier this year, will be offering support in Weymouth where Olympic sailing events will take place. Crew members on board HMS Ocean have become YouTube stars. A video of their military personnal performing Mariah Carey's All I Want For Christmas has been seen over 2 million times since it was posted earlier this month. Carey herself tweeted that it was the "best thing I've ever seen."